E-cigarette refers to a cigarette shaped device which stimulates the experience of smoking tobacco without inhaling the tobacco. E-cigarette consists of battery, atomizer and e-liquid. E-cigarettes help the smokers to quit smoking. Consumers prefer e-cigarettes over conventional cigarettes as it does not lead to diseases or death. Global e-cigarette and vaporizer market is expected to flourish at a CAGR of 23.6% during the forecast period. In 2016, the market of e-cigarette and vaporizer was valued at USD 9.1 Billion and is anticipated to reach USD 49 Billion by the end of 2024. Due to the health issues caused by cigarette, tobacco addicted persons are adopting e-cigarettes. This factor is expected to drive the market of e-cigarette and vaporizer across the globe. Asia-Pacific e-cigarette & vaporizer market is anticipated to showcase lucrative growth during the forecast period. Presence of large numbers of manufacturers is expected to drive the market of e-cigarette & vaporizer in the Asia-Pacific region. Asia Pacific region has a huge potential of e-cigarette and vaporizer market owing to the developing stage of the market. China and India has been the major contributor to the growth of Asia-Pacific e-cigarette and vaporizer market. 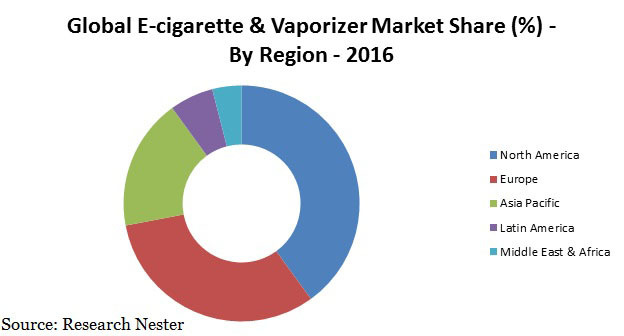 Moreover, rising awareness about e-cigarette and new product launches is expected to supplement the growth of e-cigarette and vaporizer market over the forecast period. Rising adoption of e-cigarettes in developed regions is driving the growth of the global e-cigarette and vaporizer market. Further, rising awareness about the bad effects of tobacco is envisioned to strengthen the growth of global biometric vaporizer market during the forecast period. Further, the distribution of e-cigarettes through online stores is expected to drive the growth of global e-cigarette and vaporizer market. Moreover, increasing internet penetration rate and rising inclination of consumers towards online stores is anticipated to garner the growth of global e-cigarettes and vaporizer market. However, heavy tax rates imposition by the government is likely to limit the growth of global e-cigarette & vaporizer market. Further, unregulated manufacturing process in China is expected to negatively impact the growth of global e-cigarette and vaporizer market. Simple Vape C0. London Ltd.